سنگ‎های آتشفشانی نشوه در شمال باختر ساوه واقع شده، بخشی از کمربند ماگمایی ارومیه- دختر محسوب می‎شوند. این سنگ‎ها عمدتاً از نوع بازالت، آندزی‎بازالت، آندزیت تا تراکی‎آندزیت هستند. در بررسی‎های میکروسکوپی این سنگ‏ها شواهدی از عدم تعادل بلور با ماگما نیز دیده می‎شود که از آن جمله می‎توان به بافت غربالی، وجود دو نسل سالم و دگرسان شده پلاژیوکلاز، حاشیه واکنشی، خوردگی و گردشدگی فنوکریست‏ها اشاره کرد. بررسی‎های ژئوشیمیایی مربوط به نمودارهای عناصر اصلی و کمیاب نشان می‎دهد که اگر چه تبلور تفریقی در تکامل سنگ‏های آتشفشانی منطقه مؤثر بوده است؛ اما در برخی از نمودارها نوعی پراکندگی و روندهای غیر عادی نسبت به روند تفریق به چشم می‎خورد، که این حالت می‎تواند بیان کننده اختلاط و آلودگی ماگمایی باشد. 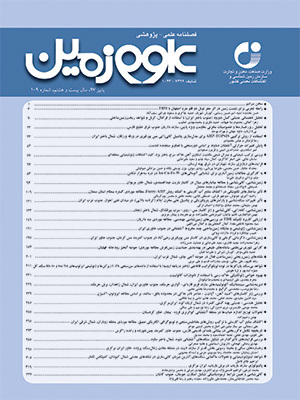 ناهماهنگی و تغییرات زیاد در غلظت برخی عناصر نظیر Sr و همچنین نمودارهای دوتایی Nb-Nb/Y و Zr/Rb-Rb نقش اختلاط ماگمایی را در شکل‏گیری سنگ‏های آتشفشانی منطقه نشوه نشان می‎دهد. با توجه به موارد ذکر شده می‎توان گفت که مهم‎ترین فرایند تشکیل سنگ‎های آتشفشانی منطقه نشوه تفریق و اختلاط ماگمایی است. همچنین اختلاط پالس یا پالس‌های ماگمایی جدید با ماگمای تفریق یافته مؤثرترین مکانیزم برای تحول ماگمایی سنگ‎های آتشفشانی منطقه مورد مطالعه است. Neshveh volcanic rocks located in the NW Saveh are parts of the Uromeyeh-Dokhtar magmatic arc. The rocks are mainly basalt, basaltic andesite, andesite and trachyandesite in composition. Petrographical studies represent some evidences for the lack of equilibrium between crystals and magma, such as sieve texture, two generation of fresh and altered plagioclase, reaction rim, corrosion and rounding of phenocrysts. Major and trace element diagrams show, although crystal differentiation was effective in the evolution of the study rocks, the scatter and unusual trends, which are observed in some diagrams in comparing with fractionation trend, reflect magma mixing and contamination were also important during magma generation. Inconsonance and high variations in Sr concentrations together with binary diagrams of Nb/Y-Nb and Rb-Zr/Rb reveal magma mixing role in the evolution of Neshveh volcanic rocks. Considering the above facts, we can conclude that magma mixing and magmatic differentiation were the important processes in formation of the Neshveh volcanic rocks. As well as, the incorporation of new magmatic pulse(s) with differentiation magma is the most effective mechanism for the evolution of volcanic rocks from the study area. Amidi, S. M., 1975- Contribution a letude stratigraphique, petrologique et petrochimique des roches magmatiques de la region Natanz-Nain-Surk (Iran central). These univ. Grenoble, France, p. 316. Berberian, F., Muir, I. D., Pankhurst, R. J. and Berberian, M., 1982- Late Cretaceous and early Miocene Andean-type plutonic activity in northern Makran and Central Iran. Journal of the Geological Society, V. 139, p. 605-614. Berberian, M. and King, G. C. P., 1981- Toward a paleogeography and tectonic evolution of Iran. Canadian Journal of Earth Sciences, V. 18, p. 210-265. Berberian, M., 1983- The South Caspian: a compressional depression floored by a trapped, modifiedoceanic crust, Canadian Journal of Earth Science, V. 20, p. 163-183. Caillat, C., Dehlavi, P. and Martel-Jantin, B., 1978- Geologie de la region de Saveh (Iran), contribution al etude du volcanisme et du plutonisme tertiares de la zone de Iran central, these de Doctorat de Specialities, Grenoble University. Gansser, A., 1955- New aspects of the geology in Central Iran. Proceeding of the 4th world petroleum Congress Survey of Iran, no, 32. Ghalamghash, J. and Fenodi, M., 1998- Geological map of Saveh Quadrangle (scale 1:100000). Geological survey of Iran (in Persion). Ghasemi, A. and Talbot, C. J., 2006- A new tectonic scenario for the Sanandaj-Sirjan Zone (Iran). Journal of Asian EarthScience, V. 26, p. 683-693. Gill, R., 2010- Igneous rocks and processes a practical guide. Wiley-Blackwell, Malaysia, p. 428. Harker, A., 1909- Rhe natural history of igneous rocks. Methuen, London, p. 348. Ionov, D. A. and Hofmann, A. W., 1995- Nb–Ta-rich mantle amphiboles and micas: implications for subduction-related metasomatic trace element fractionations. Earth Planetary Science Letters, V.131, p. 341–356. Irvine, T. N. and Baragar, W. R. A., 1971- A guid tochemical classification of the common volcanic rocks. Canadian Journal of Earth Sciences, V. 25, p. 523-548. Le Bas, M. J., Maitre, R. W., Streckeisen, A. and Zanettin, B., 1986- A chemical classification of volcanic rocks based on the total alkalis-silica diagram. Journal of Petrology, V. 27, p. 745-750. Lockwood, J. P. and Hazlett, R., 2010- Volcanoes Global Perspectives. Wiley-Blackwell, p. 551. Pearce, J. A., 1983- Role of the sub-continental lithosphere in magma genesis at active continental margins. In: Hawkesworth, C. J. and Norry, M. J., 1983- Continental basalts and mantle xenoliths. Shiva Publications, p. 230-249. Peccerillo, A. and Taylor, S. R., 1976- Geochemistry of Eocene calc-alkaline volcanic rocks from the Kastamonu area, northern Turkey. Contributions to mineralogy and petrology, V. 58, p. 63-81. Rollinson, H. R., 1993- Using Geochemical Data: evaluation, presentation, interpretation. Longman Group UK Ltd, London, United Kingdom, p. 352. Saccani, E., 2015- A new method of discriminating different types of post-Archean ophiolitic basalts and their tectonic significance using Th–Nb and Ce–Dy–Yb systematics. Geoscience Frontiers V. 6, p. 481–501. Shelly, D., 1993- Microscopic study of Igneous and Metamorphic rocks. Champan & Hall, London, p. 184. Sun, S. S. and McDonough, W. F., 1989- Chmical and isotopic systematic of oceanic basalts: implications for mantle composition and processes. In Saunders, A. D. and Norry, M. J., (eds.) Magmatic in ocean basins. Geological Society Special Publication, London, V. 42, p. 313-345. Suzaño, N., Becchio, R., Sola, A., Ortiz, A., Nieves, A., Quiroga, M. and Fuentes, G., 2017- The role of magma mixing in the evolution of the Early Paleozoic calc-alkaline granitoid suites, Eastern magmatic belt, Puna, NW Argentina. Journal of South American Earth Sciences, doi: 10.1016/j.jsames.2017.02.008. Treuil, M. and Varet, J., 1973- Criteres volcanologiques, petrologiques et geochimique de la genese et de la differenciation des magma basaltque: example de I Afar. Geology, V. 15, p. 401-644. Wilson, M., 2007- Igneous petrogenesis, a global tectonic approach. London, p. 466. Winter, J. D., 2001- An Introduction to Igneous and Metamorphic Petrology. Prentice-Hall Inc, p. 796. Wood, D. A., 1979- A variably veined suboceanic upper mantle: Genetic significance for mid ocean ridge basalts from geochemical evidence. Geology, V. 7, p. 499-503.